Sony has unveiled its new smartphone family for 2015, comprised of the Z5 and Z5 Compact as well as a new flagship Z5 Premium that sports a 4K IPS panel packing a category-first 3,840 x 2,160px resolution display. Although the spec sounds overkill for a handset and it likely is, those who were able to go hands-on with the Z5 Premium at Sony's IFA event couldn't find a reason to complain about the 5.5" 806-ppi display. In my book, this is Sony trying to up the ante with a differentiating feature, not unlike Samsung's Edge models that give the company a conversation starter, while a majority of users will still buy the regular, less expensive model that carries on with all other high-end specs. In fact, the display is the only aspect separating the Xperia Z5 Premium and the standard Z5. Both phones are powered by Qualcomm's Snapdragon 810 SoC, 3GB of RAM, 32GB of internal storage with a microSD slot for expansion, a new 23-MP camera with uber-fast autofocus (more on that in a second), waterproofing and a side power button with an incorporated fingerprint reader. Both phones claim "up to 2-day" battery life though in order to achieve that, the Z5 Premium carries a slightly larger 3,430mAh battery vs. the Z5's 2,900mAh. The design language on all Z5 models is the same, following a similar theme as previous Z models. I can personally attest to Xperia's great build quality, having used a Z3 as my daily driver for the past year, I see this as a big positive even though not everyone is a fan of having a glass slate on the back and front. The 5.5-inch Z5 Premium will be available in black, gold and chrome, the 5.2-inch Z5 in white, black, gold and metallic green, while the 4.6-inch Compact gets white, black, yellow and coral. As with previous iterations, the Compact is smaller but slightly chunkier at 8.3mm thick, the Z5 is 7.3mm thick, and the Premium with its bigger battery is 7.8mm thick. Sony's image sensors have long been recognized as the best in the business and they can be found in many competitors' phones (LG G4, Galaxy S6, iPhones). Now the company expects to bring the best they can produce to its own line of smartphones, using their latest 1/2.3 23-MP Exmor RS sensor. Sony is promising 0.03s focusing times, sporting phase detection autofocus with 192 focus points, up to ISO12800 for photos and ISO3200 for videos, improved Steady Shot features, as well as 4K video recording. It's supposed to be a beast. New to the Xperia family is a fingerprint reader on the redesigned power button that forgoes the round design in favor of a subdued rectangle button that is supposed to recognize your fingerprint while unlocking your phone in a single motion, sounds really nice on paper. It's compatible with FIDO online payments, too. For now the phones are running Android 5.1, with an upgrade to M planned. Sony is also changing its Android strategy with the Z5 family receiving a near pure Android experience according to the company. 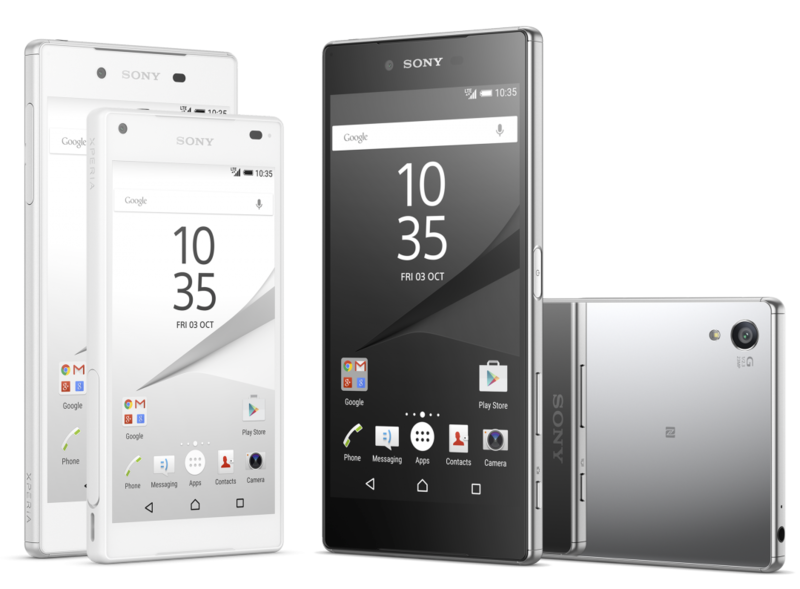 The Sony Xperia Z5 and Z5 Compact will launch globally in October with the Premium model following in November. No pricing will be disclosed until they are closer to launch but we can imagine those will align with current outgoing models on its respective categories and $100-150 extra for the 4K capable Premium.